Getting myself to Canada’s north has been on my bucket list for some time. It is not an easy place to get to though. Travel costs to get to and from the region can be prohibitive, and the remotest areas are accessible only by air. The efforts to get there, however, were amply rewarded. My earliest attempts to research a trip to the North were centred on an canoe expedition on the Nahanni River. The cost, and time committed to a single activity, pushed me to explore other alternatives that would provide a greater diversity of experiences within a 2 week holiday. If you are expecting shopping malls, a long list of fine dining options, or any other of the high niceties of big city life, this region might disappoint. If, on the other hand, you would like to enjoy an unobstructed front seat view of nature, and be willing to participate in it in any shape or fashion, then hurry up to get here for as a nature lover, you will definitely get that long awaited fix! Finally, despite what your parents may have taught you, DO talk to strangers! We met some of the nicest people all along our travels. Whether it be hometown folks like Myra & Joe from Whitehorse, Ans & Niko from The Netherlands, or Tim & Debbie from Oregon, our interactions enriched our experiences and led to new friendships. This is the right region if you are hoping to see wildlife. There were many opportunities at each of our stops along the Circle Route. Whether they be air, water or land-based, we saw a vast array of wildlife that included mountain goats, eagles, salmon, grizzly bears, whales and much much more. We were bear aware during all of our outings, and brought along extra precautions like bear spray and bear bangers (which I mailed to myself in advance via parcel post to our first hotel on the trip). While we love the Ottawa Valley, one of the drawbacks of our hometown is the persistently high levels of humidity, and lack of wind. We were taken aback by the freshness of the air when we exited the airport terminal in Whitehorse, and with the pleasing scent of the Boreal forest (think pine trees, but not heavy and fake like a car freshener). While warm (at least this summer) like southern Canada, the air is dry all year round. The morning air is fresh, with our days kicking off at about 10°C, and quickly warming up to 25°C or more by noon. Once at that temperature, it only takes a little more sunlight to sustain the heat. With 20 hours of daylight, it was a surprise to us to experience warm (sometimes very warm) evenings right up to 11pm and beyond. The Vacation Planner, available from Travel Yukon, was a valuable resource that allowed us to quickly identify an itinerary for a 2 week trip that met all of our objectives. Our goal for this trip was to spend relatively little time in the car in order to maximize our active and leisure time in the various towns along the way. The Golden Circle Route (map) meets those criteria and offers an opportunity to visit several cities and towns in the Yukon and Alaska, while only having to travel a total of 600 kms, and offers tons of options along the way for the visitor. The Planner rightly suggest that at least 5 days be dedicated to the Circle Route. We did it in 2 weeks and left with some unfinished business. At least we have several good reasons to return! We caught an early flight from Ottawa to Whitehorse (via Vancouver) that had us on the ground in Whitehorse by 12:30pm local time. This is the land of the midnight sun, and with 20 hours of daylight, we still had almost 10 hours to enjoy for the balance of our first day. We enjoyed city walks, cycling along excellent bike paths, hiking and the local restaurant and bar scene. There is much more to do in Whitehorse and you can read more about our activities in the area here. Getting to Skagway by car was half the fun. 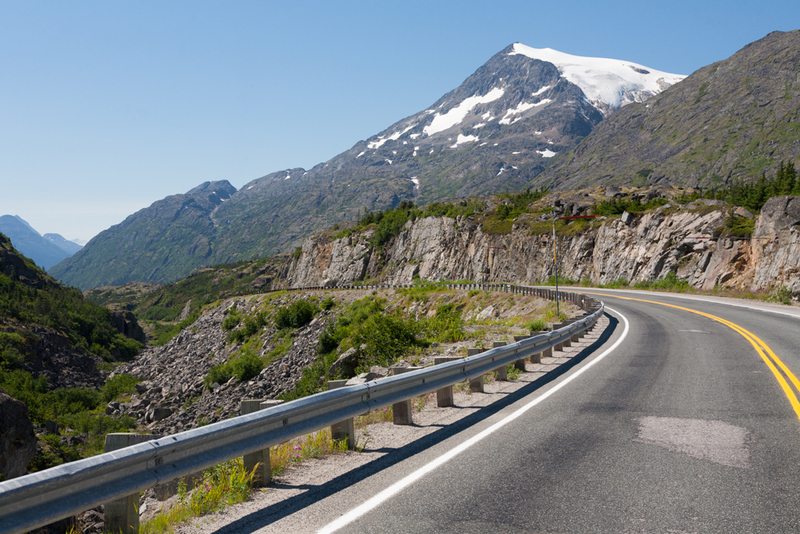 For most of the trip, the Klondike Highway follows rivers and lakes, and is flanked by mountains on either side. We stopped at many pullouts along the way to either take pictures, or stretch our legs. We enjoyed a 1/2 day trip on the White Pass & Yukon Route train, hiking, as well as time exploring the tidal flats in Dyea. You can read more about our activities in the Skagway area here. The only way to get to Haines from Skagway is by ferry. The one hour trip on the Alaska Marine Highway line was beautiful. We explored the Chilkoot River, Chilkoot Lake, and Fort Seward; cycled around Haines; and made a day trip visit to Juneau thanks to Alaska Fjordlines. We also used this halfway mark on our trip to get some laundry done and buy more groceries (see Resources below). I was happy to learn through my advance research that the only grocery store in Haines Junction closed the year before (2012), so restocking in Haines was vital. You can read more about our activities in the Haines area here. The drive to Haines Junction from Haines, Alaska along the Haines Highway (yes, that’s a lot of “Haines”) is a highlight in and of itself, and deserving of its own dedicated page in the Photography section of this blog site. Haines Junction is the gateway to Kluane National Park. While there, we visited the Da Ku Cultural Centre, hiked in Kluane, and had a fantastic day white water rafting on the Tatshenshini River. You can read more about our activities in the Haines Junction area here. The communities we visited are small by North American standards. The availability of lodging and services should be researched ahead of time and not taken for granted. We booked our lodging more than 4 months ahead of time and ran into issues trying to get consecutive nights in one location. Reserving lodging 6 to 12 months ahead of time is highly recommended. Gasoline is widely available while the services of a mechanic are not. Even IF the CAA/AAA can get help to you, the distance to the closest garage, and availability of parts, could result in delays to your travel plans. We were expecting to pay significant premiums over prices in the south. While prices were a little higher, they were reasonable given the transportation requirements to get goods there. The one exception to this is the cost of wine in the Yukon – given lower purchasing volumes compared to my home province (Ontario), the cost can be significantly higher (eg. $12 wines selling for $20 at the liquor store in Whitehorse). On the other hand, local beer is comparably priced. We bought wine while in Alaska and brought it back to Canada with us. Do your research. Web sites like Trip Advisor provide excellent accounts written by fellow travellers on hotels, restaurants and activities. Read up and understand what to expect in order to avoid disappointment. ♦ I bought a North American long distance card from my local grocery store, tore off the top half (as I have done many times before) and assumed that it would work in the Yukon. Lo and behold, I could not place calls using the card. The customer service department for the card issuer advised that the card could not be used in the Yukon, Northwest or Nunavut Territories. I guess I should have read the fine print on the tear away portion (apparently there was not enough room to print the exceptions on the back of the card itself). ♦ Internet access is widely available in most hotels, inns, lodges and B & B’s. However, the quality of the connection should not be taken for granted. Apart from WiFi signal issues, many establishments have limiters to prevent abuse of download privileges, so the quality of your Skype video call might suffer. ♦ Cell phone network access is limited in this region, and your setup may either not allow connection to alternate networks, or come at a steep price. 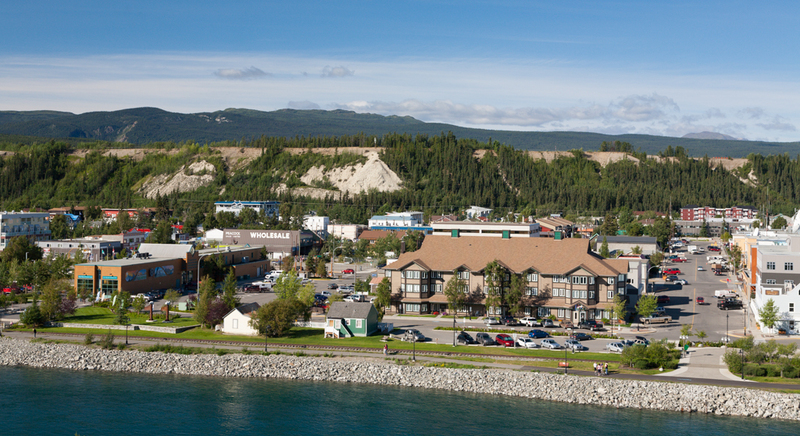 Best Western Gold Rush Inn, Whitehorse, Yukon – follows the standard Best Western format. Good for its location in the heart of downtown. Chilkoot Trail Outpost, Skagway, Alaska – a perfect retreat from the cruise ship crowds in Skagway. Kathy & Fred Hosford are charming hosts. 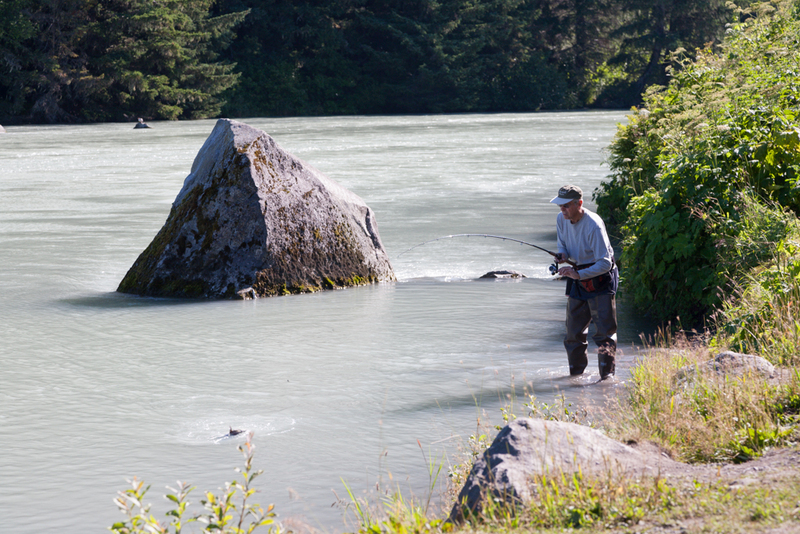 Chilkoot River Lodge, Haines, Alaska – the best place to get immersed in all things Alaska. From the patio door of our room, we could have a coffee and watch eagles, grizzly bears and salmon all in or near the river 100 yards away. Parkside Inn, Haines Junction, Yukon – clean and modern décor with easy access to Kluane National Park. Cozy Corner Motel & Restaurant, Haines Junction, Yukon – we weren’t able to book all of the nights that we wanted at the Parkside Inn, and while it represented a vastly different alternative (very simple accommodations), we understood what we were getting into and got what we expected. No web site and no e-mail confirmations – just the owner’s word that you are in his reservation book! Burnt Toast Café, Whitehorse – Excellent food, but you’ll have to put up with mediocre service to get it. Earl’s Restaurant, Whitehorse – Great food & atmosphere. Dirty Northern Public House, Whitehorse – Simple but tasty menu at affordable prices. Located on the left side of the Capital Hotel building on Main Street next to the Cork & Bull. The Deck, High Country Inn, Whitehorse – A casual dining alternative to the hotel’s formal dining room. Chilkoot Trail Authentic Sourdough Bakery, Carcross – We had quiche and great coffee for breakfast. Starfire Café, Skagway – Excellent Thai food close to the main drag but away from the tourist traps. Fireweed Restaurant, Haines – Fine dining enjoyed by locals and visitors alike. The output from the kitchen is exceedingly slow (1 cook for the whole place), but if you can get a table, and put up with your stomach growls, the wait will be worth it. Northern Lights Steak & Seafood Restaurant, Haines Junction – A very decent roadside restaurant that is part of the Alcan Motor Inn. This place is clean, the servers are friendly and the food is pretty good for this class of restaurant. Village Bakery, Haines Junction – We were fooled by the name of this spot and did not drop by until the morning of our departure. This place is more than just a bakery and has great offerings for any time of day. 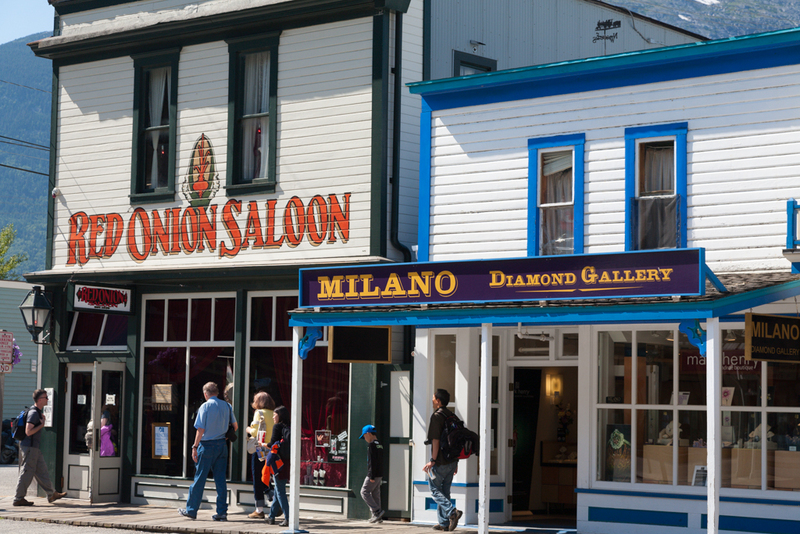 It is also a bit of a hub for the social scene in Haines Junction, with concerts being hosted on the deck from time to time. Drop by to check out the food and find out the latest happenings. Yukon Tourism – The official tourism site for the Yukon, and your first stop when planning your trip. Yukon Hiking – An excellent website that will simplify the task of planning your hikes in this region. Berton, Pierre. Klondike: The Last Great Gold Rush 1896 – 1899. This book, first published in 1958, and revised in 1972 provides one of if not the most complete historical accounts of the Klondike Gold Rush. Read about a host of colourful characters, and the trials they endured, as they made and lost fortunes. Alaska Marine Highway System – Our ride from Skagway to Haines, Alaska. There is only 1 sailing per day, so reserve well in advance to guarantee your spot. Alaska Fjordlines – More than just our ride for our daytrip in Juneau, Alaska – the folks at Alaska Fjordlines want to ensure that you get your fill of wildlife during the trip (and they succeeded!). Book in advance to avoid disappointment. White Pass & Yukon Route Railroad – A fun touristy thing to do while in Skagway that opens a window into the past. 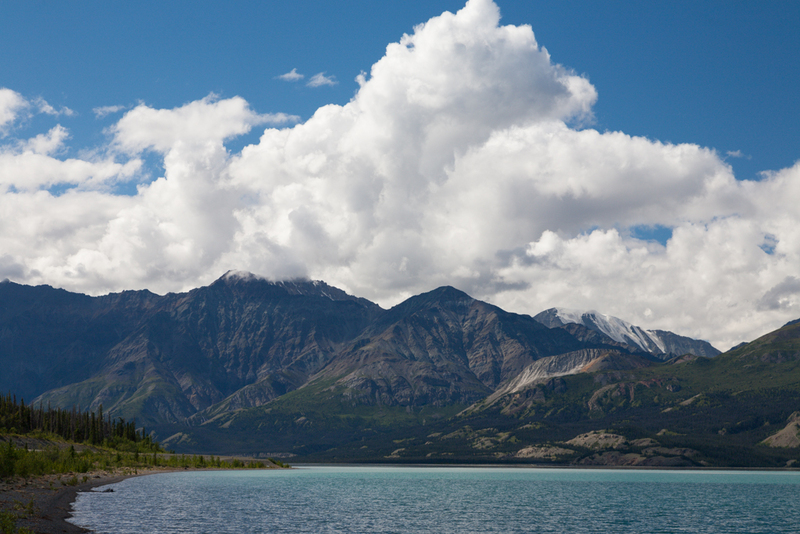 Kluane National Park – The opportunities range from easy, moderate and difficult hikes, to full on mountaineering. You could also check out flightseeing options while you are in the region. Tatshenshini Expediting – We paddled with the eagles during a day trip river raft outing on the “Tat”. Da Ku Cultural Centre – This is a beautiful facility (opened in 2013) that pays tribute to the Champagne and Aishihik First Nations, their land, and traditions. A room filling map on the floor displays the land occupied by this first nation, and we were lucky enough to have the significance of some of the trails & migration routes used by the people explained to us by a staffer. Real Canadian Superstore, Whitehorse, Yukon. Everything under one roof with extended hours of operation. We loaded up here upon our arrival. Olerud’s Market Center, Haines, Alaska – there are others, but we preferred this one for the way the store is kept, and the produce offered. Given that there are no grocery stores in Haines Junction, it made perfect sense to stock up again here. Moose Horn Laundry, Haines, Alaska – is located just north of town on the Haines Highway. The owner is friendly and the place is bright and super clean – almost a destination on its own! Haines was at the halfway mark of our trip, and this was as good a place as any to get some laundry done. Thanks Mark! We did feel like we had unfinished business, and that would definitely be an option. We met a German trio (father & 2 sons) cycle camping from Anchorage to Haines (that would be a bit too long for us though! ).